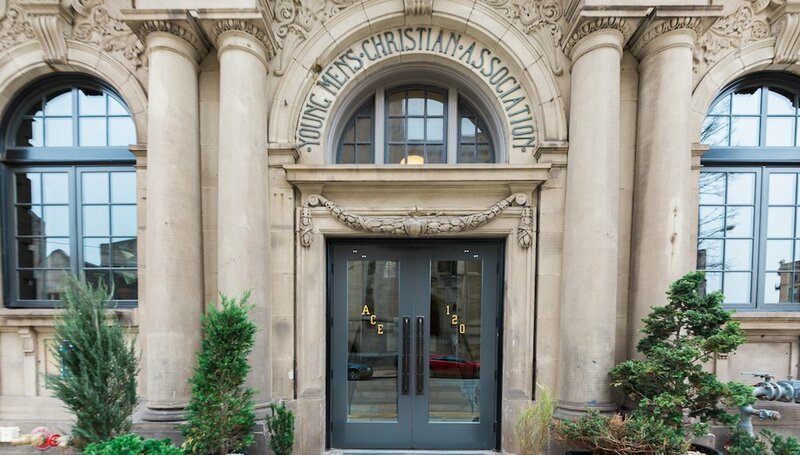 The first person John Brewer saw when he entered the YMCA in the 1950s was not a receptionist as you see when you enter the same building today, but a security guard. Brewer, then in elementary school, would pause to tell the guard he was headed to the pool and then run down the stairs, into the shower room. Brewer and his friends would have to stop again — just long enough for the requisite pre-swimming rinse, and then, finally, they’d run like hell, away from the exposed pipes bursting with steam, to the pool. It was a standard pool, nothing particularly special at the time about the blue and white tiles of the pit or the marble at the edges. What made it special was the people. Swimming was not widely available for black people in 1950s Pittsburgh, but the pool at the East Liberty YMCA was open water. The pool was the heart of the YMCA. It was the first integrated pool Brewer swam in, drawing a mix of locals and immigrants who made up the neighborhood at the time. They spent hours and hours in that pool. They took swimming lessons. They evaded the instructor, who would stand with a six-foot pole in hand, shoving the shoulders of the swimmers and commanding them not to touch the sides of the pool, to keep treading water. The Ace is a chain that tries never to look like one. At the Ace, you will not see the beaded pillows of a Hilton. There are no bowls of fake fruit or paintings of the seaside in the lobby. Instead there’s a record player with stacks of vinyl curated by local DJs, a vintage edition of the board game Risk you can actually play, a book you’re invited to draw in. Each Ace is designed to replicate the culture of the city it is in, and here that culture takes the form of mismatched throw pillows and side tables of Pennsylvania wood. The stained glass mural above the front door is reminiscent of Pittsburgh’s rivers, the black and yellow tiles of the bathroom are a tribute to the Steelers. There is steel everywhere. 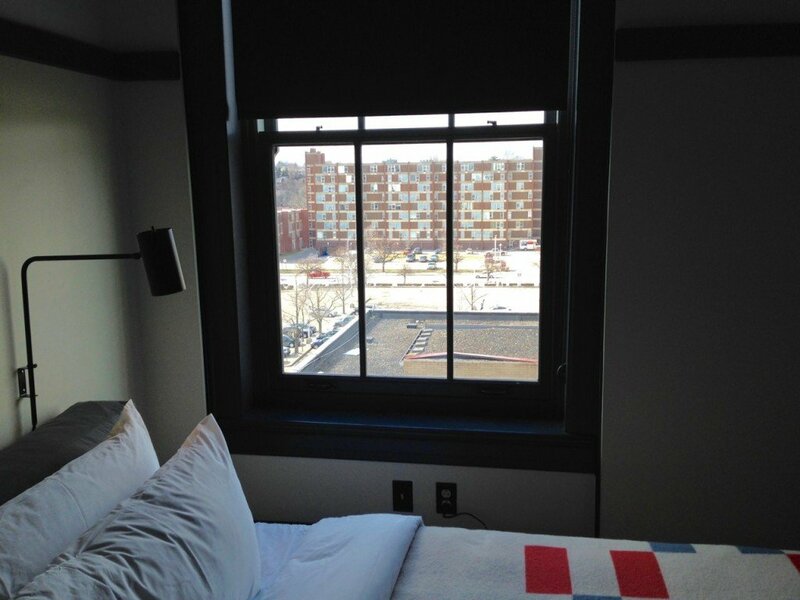 Upstairs, the simplistic cots are covered with Pendleton blankets whose blue and red squares are meant to invoke Pennsylvania quilting tradition, and the mini-bar is filled with Pittsburgh’s Wigle whiskey and mixers from the Ace bar. At the Ace you are meant to think, to feel Pittsburgh. These details are there to show you that the Ace is more than just a hotel, more than just a business. It is a distillation of culture, a place that understands how to be “both by the neighborhood and for the neighborhood.” It is a place where the management wants you to feel like you belong. But this may be an impossible task for any business in East Liberty. 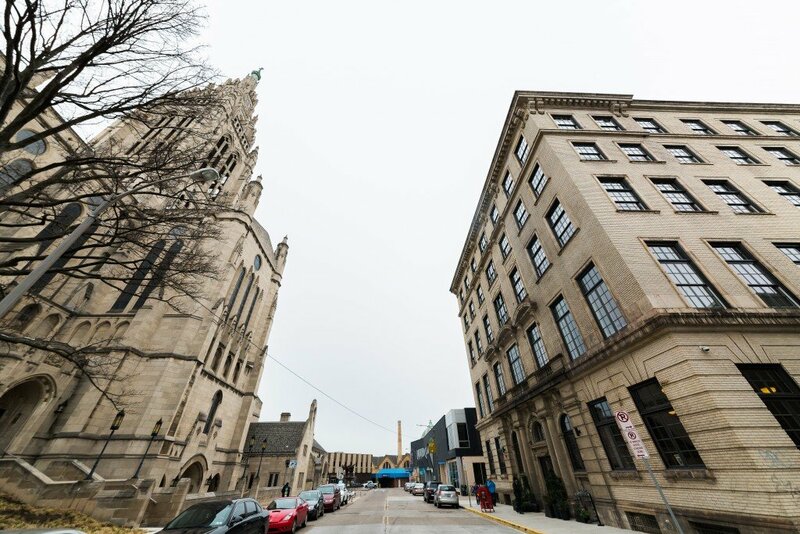 The windows of the Ace’s lobby and the east-facing rooms look out on the East Liberty Presbyterian Church, where until recently a line of people waited just a few steps from the Ace front door to enter the church’s soup kitchen. (It has since moved to a new space down the street.) On the other side of the building, the upstairs rooms look out on the mixed-income Penn Plaza apartments, which are soon to be torn down to make room for new, higher-end residential and retail development. You can look out on a U-Haul heavy with the possessions of the latest casualties of East Liberty urban renewal without getting out of bed. Whether through eviction, as is the case at Penn Plaza, or because rent has risen so dramatically, many residents of what was once a predominantly black neighborhood are leaving. The Ace is part of new neighborhood development that is moving too fast for many of its residents. What does it mean for a business to be “for” that neighborhood? When John Brewer talks about his childhood and adolescence, it comes out as a map of East Liberty. Every memory lives one block from the last. Brewer was born in 1945 on Mayflower Street, just down the street from the Ace. After his family moved a couple miles east to Homewood, Brewer would take the trolley from Homewood and be in East Liberty in five minutes. Back then, entering East Liberty was an experience for all the senses. Brewer would hang his head out the window and watch the movements of the other passing trolleys (the 75 Wilkinsburg, the 82 Lincoln), hear the chimes of the East Liberty church bells, and smell Polish sausages and freshly baked crackers from the Nabisco Plant further down the East End. When he thinks about the “feel” of East Liberty, Brewer thinks of his first suit that he bought at 17 at Fintex, down the street from where the Ace is today. He thinks of the leisure suit’s blue fabric, so thin that when someone dropped a cigarette on him on his way to a job interview, the pants literally burned off his body. He thinks of Hahn’s Department Store where he bought his first set of furniture, and of Stagno’s, his childhood stop for day-old donuts. Brewer’s East Liberty had five movie theaters, five-and-dime stores, and an Isaly’s, but the centerpiece of the neighborhood was the YMCA. The YMCA was the neighborhood refuge, where everyone was welcome and everyone was comfortable, Brewer says. Though the neighborhood was predominantly black, there were large Polish, Irish, and Italian populations, and they all came together at the Y: the workers migrating from New York and the South, the native Pittsburghers, the rich, the poor, the merchants, the young, the famous. It was the place where local merchants discussed business plans and Steelers came to exercise. Brewer remembers seeing famous wrestler Bruno Sammartino in the gym, watching as another kid threw a basketball at the wrestler, then watching as the kid sprinted from the room when Sammartino stood up from his bench. That was the 1950s. Today Brewer is 71, but he still has the mischief in his eye of the twelve-year-old who hopped on a train and took it all the way to Ohio to avoid showing his mom a bad report card, and he still remembers the joy of the YMCA. Then the familiar narrative: The 1960s brought the rise of the malls, white flight to the suburbs, and the decline of areas like East Liberty. The city tried to save the neighborhood with mega retail stores and wide access roads. Housing was demolished. Businesses closed. “Urban renewal” translated into exclusion and then desertion. By the end of the 70s, Brewer’s East Liberty was gone. It was right about then that Brewer arrived back in Pittsburgh after time away for college and service in the military, and he went to his old refuge, the YMCA. That too was different. been a chameleon reflecting the state of the community, and it was bad.”[/blocktext]Brewer’s last memories of the YMCA before it closed in the 1980s are of the pool. He doesn’t remember the specifics as much as the feeling: it was gloomy. He remembers the shower room, the same old steaming pipes, but nobody running like hell under them. The room was deteriorating. And the pool itself—nobody was maintaining it. There was no lifeguard, no swim instructor on duty. Today the gym at the Ace is still three stories tall and still looks like it belongs in the 50s. An old running track loops around where the basketball hoops used to be. The wood floor is original, the blue free throw line worn down from years of tennis shoes. Brewer used to run across that floor for games of fire (dodge) ball. Today, it is once again filled with people, used for open game nights and community dances. On the night of a soul- and funk-themed dance, silver tinsel streamed from the third story rail and a projector cast film of the 1974 Jackson 5 on the wall of chipping paint. A packed, mostly white room partied to James Brown and the Patterson Twins, people occasionally pointing to the fading mural of the boxer on the wall as they all danced on the past. 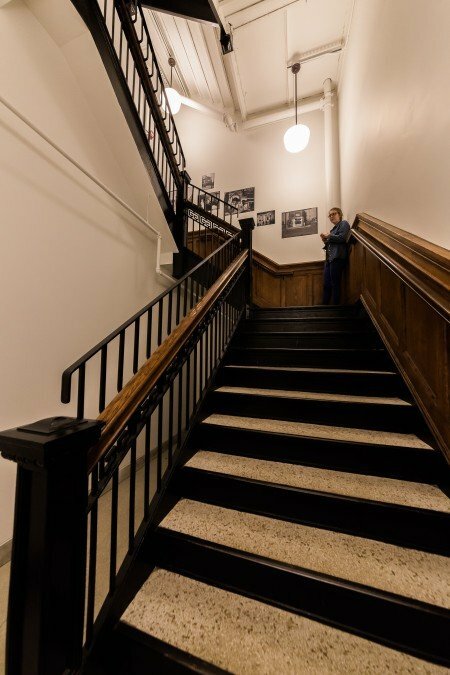 Outside the gym, the marble staircase leading up to the second floor has been turned into a gallery space for the display of photos by Charles “Teenie” Harris, an African-American Pittsburgh native who documented the black experience in Pittsburgh from 1935 to 1975. 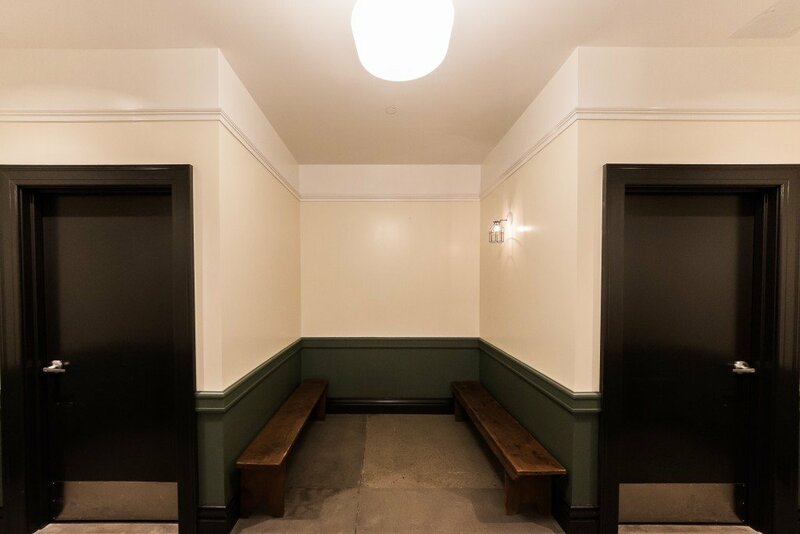 As you travel up to your guest room or down to the bathroom in the basement, you must travel through the bright times of Brewer’s East Liberty. A few of the photos were shot in the YMCA back then: 1962 — the Davenport Sisters Band in matching white taffeta leaning against the piano that was once in the ballroom at the top of the stairs; 1961 — the Alpha Phi Beta sorority in the ballroom with left legs crossed neatly over right; 1953 — lifeguard training in the pool, one girl’s arm wrapped around the head of another’s while a boy with a whistle around his neck corrects her rescue form. Here we are, the people in the photos say. This is what we looked like. This is what once was. In each room of the hotel there are more photos from the Carnegie Library archives, a tiny snapshot of Pittsburgh past hanging on the wall with the other cultural markers — the guitar, the collapsible stool, the guide to simple stretches. Everywhere in the Ace, from the YMCA inscription above the front door to the photo in your bedroom, there are these markers of the past, reminders that you are there because somebody else no longer is. The Ace didn’t create the problems in East Liberty. The Ace is trying. They’ve restored a building that otherwise could have sat empty or been torn down. 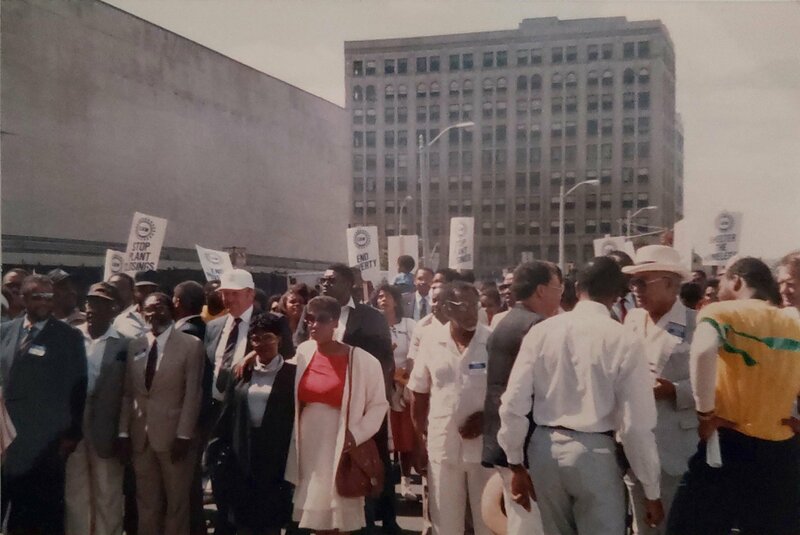 They’ve hosted events to discuss the Harris photos and what they say about 20th-century Pittsburgh’s black urban experience. They’ve hosted screenings of a documentary about gentrification and displacement titled East of Liberty: A Story of Good Intentions. Every day in the lobby, locals come and mingle and eat chocolate croissants and are comfortable there. John Brewer is comfortable there. But like it or not, the Ace is part of a trajectory now out of its control. Alphabet City, the development company responsible for much of the development in East Liberty, runs eastlibertynow.com, a website that will tell you in large, bold print that “East Liberty is where you want to be.” The neighborhood is “the next hot thing.” Featured on the site this spring is the Vogue article declaring that the Ace “fell hard for Pittsburgh.” Look, the website says, the Ace is here. Things are changing, and most businesses will not take time to document those changes on their walls. 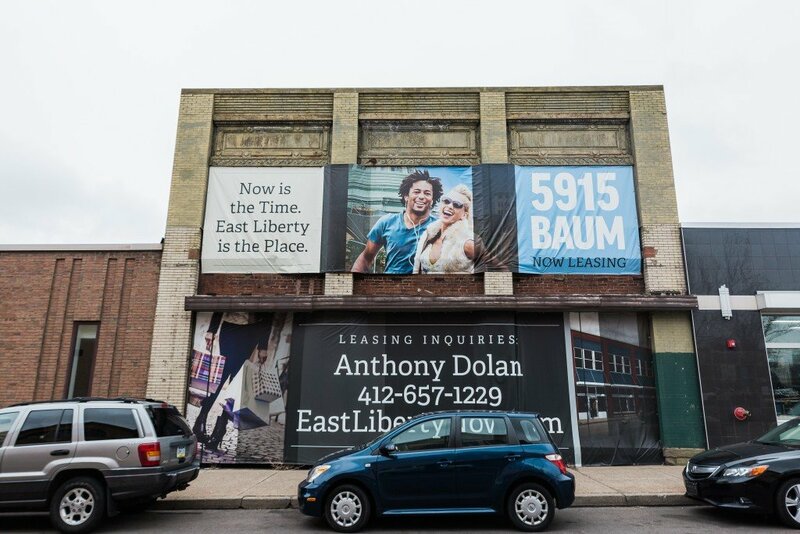 For Brewer, the future of East Liberty relies on the intangibles. That’s what always made him feel so at home, and that’s what will make him feel at home again. But there’s nobody handing out day-old donuts, and the air does not smell like crackers. Google moved into the old Nabisco Plant last spring. The Liberty Theater is now a Target. So how do you factor those things into the culture of a place? How do you factor in a smell? [blocktext align=”right”]”Who is all that for? in the final plans?”[/blocktext]If you go back down the grand staircase of the Ace and follow the signs to the restrooms, you will dead end at a wall. Between the men’s and women’s rooms there’s an open space with two benches facing each other and one light on the wall — a single bulb with a cage around it. Behind that wall is the swimming pool, the one untouched part of the building, closed to the general public. The pool looks much like it did the last time Brewer saw it, except now it is empty, and there is red tape marking the depth of the pool on its wall — four feet, six feet, seven feet. The edges of the room are filled with tables and chairs stashed away for events and the pool itself has a small pile of trash in the middle, a reminder that it has long been without water. There’s a feeble wooden fence around the edge of the pit, presumably to keep visitors from falling in, though there aren’t many people that pass through. The corner where teenagers once stood training for lifeguard duties is vacant. Upstairs the lobby is full of college students chatting over brûléed grapefruit. Three kids stand next to their dad watching, rapt, as the record player’s arm drops onto the vinyl. But in the pool it’s completely quiet. It’s blocked off from everything happening in the building and outside it. There’s something holy about the space — perhaps the last untouched remnant of the entire neighborhood just sitting there, empty. Courtney Harrell abandoned the Rocky Mountains for the Rust Belt, where she now writes and teaches. She was previously a regular contributor to Voice Media Group’s Westword and Senior Editor of Copper Nickel. She is now a student in the University of Pittsburgh’s MFA program and an intern at Longform. 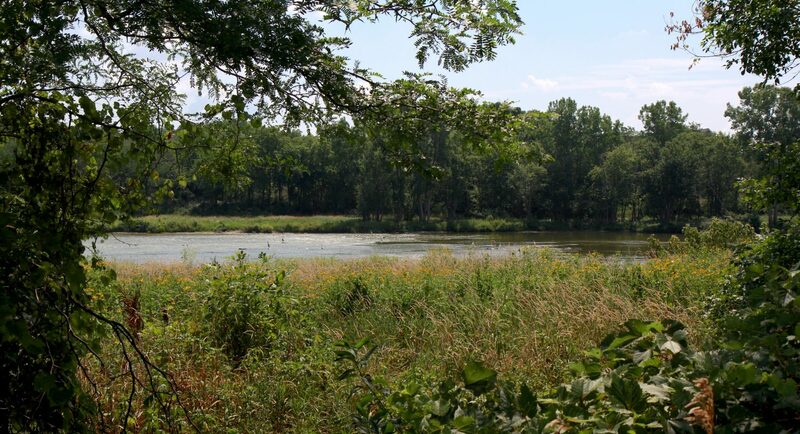 Interesting article that pulls one in to the history and the present of the area. Thanks, Courtney! Love your writing style. Thanks for a great article! Do you have a twitter / facebook account I can follow for more articles? I’ve lived around East Liberty almost my entire life, and I live at Penn Plaza currently. I used to go swimming on Fridays after school at the Y in 1969. I’ve been meaning to go into the Ace hotel to see what it’s like in there now. No, the old Liberty theater is not a Target now. The theater was torn down in the late-1960s, as part of the urban redevelopment of that time. Target was built within the past 5 years, where a high-rise apartment building (one of three built in East Liberty in the late 1960s – all now gone) used to be. Also, there weren’t any “mega retail stores” that opened in East Liberty in the 1960s/1970s. This is a vibrant story–thank you, Courtney! 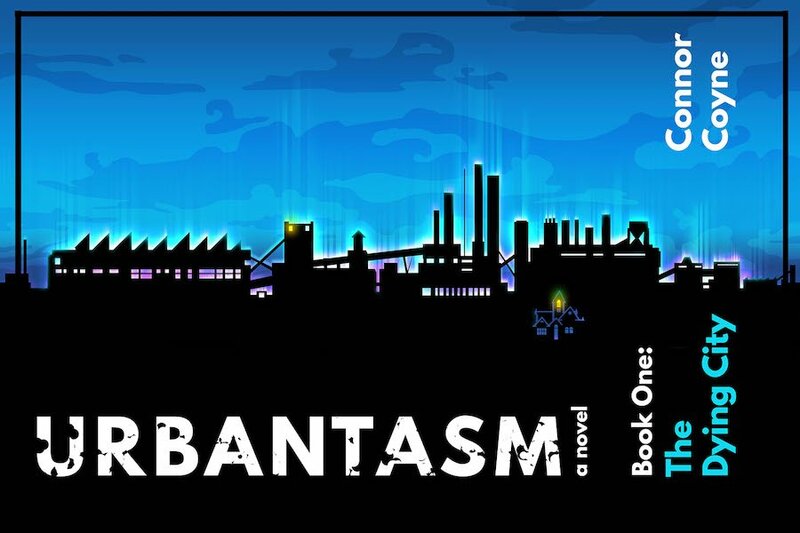 I love your writing style and how you arranged this vast and fascinating history into such a powerful story about an era gone and a different–but not necessarily better–one emerging.